Dialogue seminars as a methodology for transformative social learning and conflict resolution in international environment negotiations. 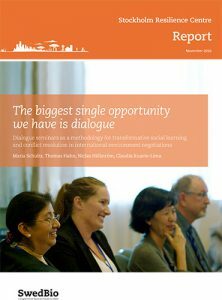 The methodology of the Multi-Actor Dialogue Seminars (MADS) described in this report, and exemplified with the two ”Quito Dialogues Seminars”, is based on experience gained over the past decade by SwedBio and a broad network of colleagues. It also builds on a diverse literature on social learning, and in particular perspectives that view it as a means for both personal and systemic transformation for enhanced environmental governance. Improving the culture of dialogue may be the biggest single opportunity we have to identify genuine solutions for a sustainable future.